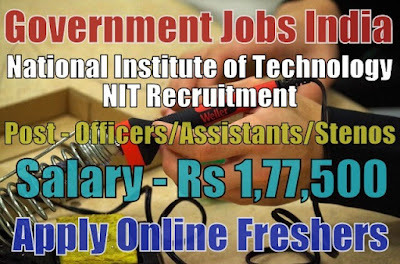 National Institute of Technology NIT Recruitment 2019-20 notification (Government Jobs in India) for 65 assistant, officer and stenographer posts. All legible and interested candidates can apply on or before (14-12-2018). Further information about the National Institute of Technology Recruitment courses and exams, vacancies, salary details, NIT Kurukshetra result and faculty careers, admission, application fee, NIT government jobs in India, national institute jobs and vacancies, educational qualifications and all other details/information about these posts are mentioned in details below. The job location for candidates will be Kurukshetra. 15. Laboratory Assistant - 02. Salary/Pay and Grade Pay - For sports officer post, the payable salary will be Rs 78,800 - 2,09,200, for senior technical officer post, the payable salary will be Rs 67,700 - 2,08,700, for technical and medical officer posts, the payable salary will be Rs 56,100 - 1,77,500, for posts(5-9,13), the payable salary will be Rs 35,400 - 1,12,400, for pharmacist post, the payable salary will be Rs 29,200 - 92,300, for stenographer post, the payable salary will be Rs 25,500 - 81,100 and for junior assistant, technician and laboratory assistant post, the payable salary will be Rs 21,700 - 69,100 per month. Further information about salary details is mentioned in the detailed advertisement. Work Experience - No further work experience required for posts (3-15). Fresher candidates and candidates with no experience can also apply for this recruitment. How to Apply - All legible and interested candidates have to apply online from official website www.nitkkr.ac.in or from the given link below.